Ceubren Yr Ellyll or The Spirits Blasted Tree by John Parry. 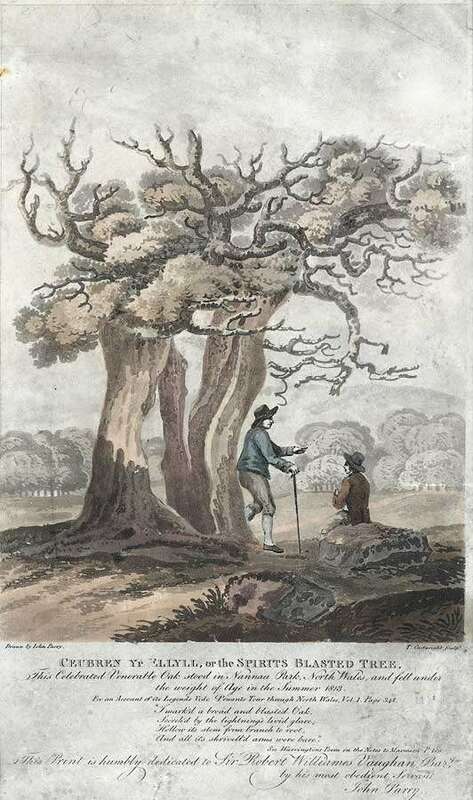 This Celebrated Venerable Oak stood in Nannau Park, North Wales, and fell under the weight of age in the summer 1813. For an Account of its Legends view Pennants Tour Though North Wales, Vol.1, Page 348. See Warringtons Poem in the Notes to Marmion. This Print is humbly dedicated to Sir Robert Williames Vaughan, Bart. by his most obedient Servant John Parry. Drawn by John Parry c.1813. Printed by Thomas Cartwright c.1816 (Colour print on Aquatint).